My Car Won’t Go into 4WD. What Is The Problem? The struggle of colder weather is when you’re on a terrain that warrants more than two wheels to get going, and your car is struggling to do that. For newer cars with AWD, this is usually just a reaction by the car’s computer when it notices it needs more wheelpower, and it simply engages. 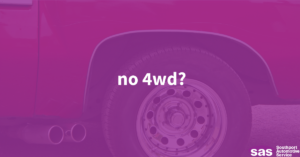 For some newer cars and many older cars, shifting into 4wd is much different, and requires a little bit of work and muscle in order to do so. Those with older Jeeps, Toyotas and similar makes will know that there’s a separate gear or lever for this exact use. But sometimes, things don’t work the way they should — and we’ve broken down why. Sometimes, you’ll pull the lever into 4WD, but it won’t actually move, as if resistance was keeping it from being in gear. This is due to an issue with the shifter, which could mean something is blocking its travel course, or it’s simply stuck in place. While it’s never easy to diagnose this yourself, there are a few ways you can investigate, based on specific make, model, and tech. You shift into 4WD High, but you can tell there’s no power to the front and rear wheels as one — so what gives? In this case, there may be an issue with your shifter linkage, which is a larger problem that prevents a connection to be made at both axles to power the wheels at one time. This is a bit of a larger issue, and likely something that can’t be fixed in the middle of the road, or on the ground in your driveway. Should you think you have any issues engaging into 4WD this season, make sure you have your car inspected and repaired before the winter hits and you’re stuck without the necessary tech and traction to get you where you need to be.